Guaido gave his first public comments to Univision on Thursday since declaring himself interim president of Venezuela. Guaido’s comments are part of a soon-to-be aired interview that was published on Univision’s website. The socialist leader blames the United States for backing a coup attempt to oust him, and he cut diplomatic ties with Venezuela’s largest trading partner. The department says it’s taking the step for security reasons and that the embassy in Caracas will stay open. The move follows the Trump administration’s rejection of Venezuelan President Nicolas Maduro’s order to break relations with the U.S. and for American diplomats to depart by the weekend. The administration says Maduro’s order isn’t legal because the U.S. no longer recognizes him as Venezuela’s legitimate leader. On Wednesday, President Donald Trump recognized the opposition leader and head of Venezuela’s parliament as the interim president. That prompted Maduro to sever relations with Washington. The U.S. also had snubbed Maduro’s decision to cut diplomatic ties with the United States, saying he doesn’t have the authority to expel U.S. diplomats. The two countries haven’t exchanged ambassadors in nearly a decade, but they have maintained diplomatic staff. South Africa’s U.N. Ambassador Jerry Matjila said earlier that U.S. Secretary of State Mike Pompeo had asked to discuss the political situation with the U.N.’s most powerful body. He said the “consultations” would be behind closed doors — not open. U.S. President Donald Trump on Wednesday recognized National Assembly leader Juan Guaido as Venezuela’s interim president, leading President Nicolas Maduro to demand that all U.S. diplomats leave the country in 72 hours. Pompeo told the diplomats to stay because the U.S. doesn’t recognize Maduro. Before Matjila spoke, Russia’s U.N. Ambassador Vassily Nebenzia told reporters he didn’t think a meeting is required. Russia had already denounced the U.S. decision to recognize an opposition leader at Venezuela’s legitimate president, calling it an attempted coup. Pompeo on Thursday urged other countries to step up and help Venezuelans rebuild a country he says has been destroyed by President Nicolas Maduro’s “illegitimate” government. Maduro’s government for years has rejected most foreign assistance, saying it is a cover for foreign powers to launch an invasion. The Vatican says Pope Francis is closely following developments in Venezuela and supports “all efforts that help save the population from further suffering”. A statement from Vatican spokesman Alessandro Gisotti on Thursday didn’t say if the Holy See recognized opposition leader Juan Guaido’s claim to the interim presidency. The statement said the pope “is praying for the victims and for all the people of Venezuela.” It adds that “the Holy See supports all efforts that help save the population from further suffering”. The Vatican has a delicate line to balance in Venezuela. Local bishops vocally oppose the socialist regime of President Nicholas Maduro, but the Holy See has kept up diplomatic relations with the government, to the extent that it sent its interim charge d’affaires to Maduro’s inauguration earlier this month. Turkish President Recep Tayyip Erdogan says he’s shocked by U.S. President Donald Trump’s decision to recognize Venezuelan opposition leader Juan Guaido’s claim to the presidency. Speaking at a joint news conference with Malta’s president on Thursday, Erdogan reiterated his support for embattled President Nicolas Maduro. Erdogan also said Maduro didn’t delay in calling and visiting Turkey to offer his support soon after Turkey thwarted a coup attempt in 2016. South Africa’s U.N. ambassador says U.S. Secretary of State Mike Pompeo has asked to discuss the political situation in Venezuela with the U.N. Security Council in closed consultations on Saturday morning. Before Matjila spoke, Russia’s U.N. Ambassador Vassily Nebenzia told reporters he didn’t think such a meeting was required. Britain’s foreign secretary says Venezuela opposition leader Juan Guaido is “the right person” to take the troubled country forward. Hunt said it is clear that Maduro is not the “legitimate” leader of Venezuela. But the statement stops short of recognizing Guaido as president. The chief of Venezuela’s military has reaffirmed his support for President Nicolas Maduro, saying the armed forces will never accept a leader imposed on their country. 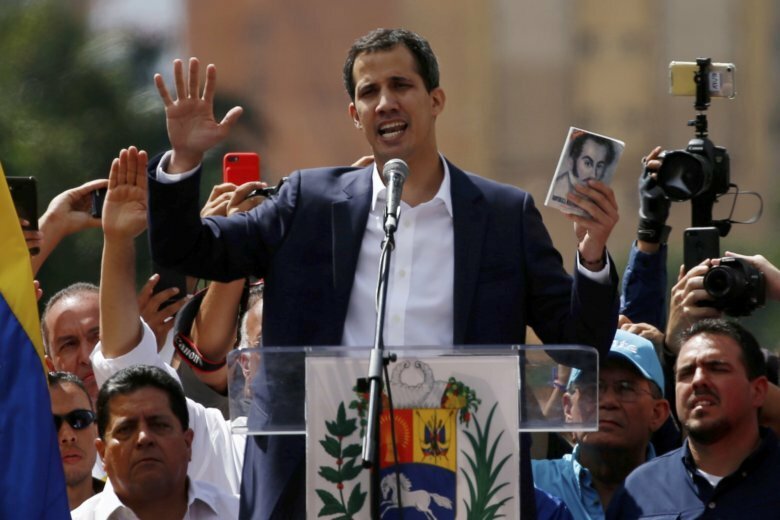 Opposition lawmaker Juan Guaido has declared himself Venezuela’s interim president, promising to restore democracy to Venezuela. Padrino Lopez said dark interests are working outside Venezuela’s constitution, emboldening the opposition’s rise. The United States, Canada and some Latin American and European countries have recognized Guaido’s claim that the constitution gives him the authority to assume power. Opposition leader Juan Guaido a day earlier spoke to masses of supporters crowding the streets of Caracas that he’s assuming the presidency. He called for new elections to restore democracy and appealed to members of the military to reject what he called Maduro’s dictatorship. Anti-Maduro National Assembly President Juan Guaido asserts that he’s Venezuela’s interim president under the constitution. Amnesty International is calling on Maduro to uphold demonstrators’ rights and immediately remove any military or police offers involved in repression. The troubled South American nation has plunged into a new chapter of uncertainty following Wednesday’s mass protests and competing claims to the presidency. The German government is backing the opposition-led National Assembly in Venezuela, while calling for “free and credible elections” in the country. The U.N. chief has called for dialogue and says violence or escalation should be avoided after the United States, many Latin American countries and others recognized Venezuelan opposition leader Juan Guaido as the country’s president. Guterres said simply: “It is absolutely essential to have dialogue, to avoid violence and to avoid escalation.” He did not elaborate. Spain’s Prime Minister Pedro Sanchez is holding talks on Venezuela with Latin American leaders in the sidelines of the World Economic Forum in Davos. Sanchez’s office also said the leader has scheduled a phone call with Venezuelan opposition leader Juan Guaido. Foreign Minister Josep Borrell, a long-time socialist, says Nicolas Maduro’s government is illegitimate but declined to follow other world leaders in endorsing Guaido. “We don’t know how, but we are going to procure free and fair elections in Venezuela,” Borrell has told reporters on Thursday. He also said the government’s top priority was to ensure the safety of more than 200,000 Spaniards living in Venezuela. French President Emmanuel Macron says that the May 2018 election of Venezuelan leader Nicolas Maduro was “illegitimate” and saluted the bravery of Venezuelans who are demanding freedom. In a tweet on Thursday in French and Spanish, Macron added his own voice to the European Union’s declared support for the restoration of democracy. Erdogan, who did not directly reference Venezuela, made the comments at a military academy Thursday hours after he spoke with Venezuela’s President Nicolas Maduro. Ecuador has joined many fellow Latin American countries, the United States and others that have recognized opposition leader Juan Guaido as Venezuela’s president in the face of Venezuela’s political and economic crisis under Maduro. Valencia was asked to comment Thursday after U.S. President Donald Trump said “options are on the table” a day earlier in response to a question whether the U.S. was contemplating military action in Venezuela. Syria has condemned what it describes as “flagrant intervention” by the U.S. in Venezuela’s internal affairs. Venezuelan President Nicolas Maduro is a strong ally of Syrian President Bashar Assad. Maduro visited Syria as foreign minister in 2011, months after the Arab country’s conflict began. Assad visited Venezuela in 2010. Russia is a key ally of Venezuelan leader Nicolas Maduro, who was sworn in for his second term in office earlier this month. Maduro’s rival Juan Gauido on Wednesday declared himself interim president before masses of demonstrators in Caracas. Russia’s Foreign Ministry in a statement issued earlier on Thursday said that the crisis in Venezuela “has reached a dangerous point” and called on the international community to mediate between the government and the opposition. Portugal’s foreign minister is calling for Venezuelan President Nicolas Maduro to “understand that his time has come to an end,” after opposition leader Juan Guaido claimed the country’s presidency. She says the EU backs Venezuela’s national assembly and that its powers should be restored and respected. China is calling on the United States to stay out of Venezuela’s current political crisis and says it opposes all outside intervention in the South American country. China’s only hope of being repaid appears to lie in Venezuela ramping up oil production, although low petroleum prices and the country’s crashing economy appear to bode poorly for such an outcome. Iran has denounced events in Venezuela, saying the opposition’s claim there that it holds the presidency is a “coup” and an attempt to take over power unlawfully. Swedish Foreign Minister Margot Wallstrom says “the people’s right to peacefully demonstrate and freely choose its leaders must be respected” in Venezuela after sometimes violent rallies in the wake of opposition leader Juan Guaido claiming the presidency. The opposition leader had declared himself interim president before a mass of demonstrators in Caracas, saying the “dictatorship” of socialist President Nicolas Maduro should end. Russian officials and senior lawmakers have reacted angrily to opposition protests in Venezuela that support opposition leader Juan Guaido’s claim to the presidency. Alexei Pushkov, chairman of the information committee at the Federation Council, on Thursday called Guaido’s declaration “an attempted coup” backed by the U.S.
Russia has been propping up incumbent President Nicolas Maduro, who took office for a second term earlier this month, with arms deliveries and loans. Maduro visited Moscow in December, seeking Russia’s political support and financial support. Konstantin Kosachev, chairman of the Federation Council’s foreign affairs committee, in a Facebook post on Thursday accused the U.S. of “inciting protests” in Venezuela. A senior official says Turkish President Recep Tayyip Erdogan has called Venezuela’s embattled president, Nicolas Maduro, to voice his support after the leader of a united opposition claimed to hold the interim presidency. Juan Guaido declared himself interim president before a mass of demonstrators in Caracas on Wednesday. The U.S., Canada and another dozen mostly Latin American countries quickly announced that they supported Guaido’s claim to the presidency. Australia is considering recognizing the rival claimant to Venezuela’s presidency after the United States and many Latin American did so.